Hello, hello... I am now the happy owner of stick blender (also known as a hand blender or immersion blender). In truth, I operate a very minimalist kitchen and don't see the need for all sorts of fancy tools, but I have been yearning for a stick blender for a long time and now that I've got one, I'm lovin' it. Let's just focus on the creamy soup aspect today. I'll be honest, my cauliflower soup recipe is going to be a rather vaguely instructive one, as I didn't really bother with any precise measurements. The good thing, though, is that it really doesn't need to be that detailed. It's easy. It's homely. It probably won't knock your socks off, but it's good and comforting and you may ask for a second helping. Or, at least, Simon did... after insisting he wasn't very hungry when I gave him his first bowl. As he went for more, I gave him a look, to which he reiterated and responded - "I'm not hungry, but it is so delicious..." Awwwww. Cut or pluck the cauliflower florets (I often trim the stem, chop it up and use it too) and set aside. Over medium heat, warm up some butter in an appropriately sized saucepan, along with the garlic and onion. When the garlic and onion has softened, add the cauliflower, then pour in just enough water or vegetable stock to cover the florets. Turn up the heat to bring to boil, then turn to medium again, partially cover the saucepan and let it cook until the cauliflower is tender - times may vary, but for me it was about 15 minutes. You can lower the heat at this point so the soup just gently simmers. Add water if you'd like to thin it out, or cook it longer if you'd like it thicker. Stir in some cream and continue stirring until it becomes one with the soup. Add salt to taste. (Having cooked the cauliflower in water instead of stock, I used a spiced and herbed vegetable salt here to give extra flavour, but this is optional.) Turn off the heat. Ladle the soup into bowls, then splash with balsamic vinegar and sprinkle with freshly cracked black pepper - be as generous as you like. Then slurp it all up with a spoon. lashings of balsamic vinegar and freshly cracked black pepper to add flavour and interest. The slosh of balsamic is inspired! Yep, the balsamic vinegar really completes the soup! It gives a light, tangy contrast, and adds so much extra character. agreed! I'd never thought of adding vinegar as well! I'm going to have to try this recipe! I use my stick blender to whip cream, seems to be quicker than using the hand held beaters. This is awesome! AFD sent me a whole cauli and I've been wondering what to do with it .. now I know :) With this lovely wintery day we're having, soup will go down especially well tonight. Oh, sounds yummy! I never really do know what to do with cauliflower. I mean, in theory, I like it. In practice, it usually sort of sits there. Sadly there was only a bit of cream left in the fridge that day. But it still did the job! i love cauliflower (esp roasted, esp with lemon and butter) but i had a bland cauli soup experience once so find it hard to fathom. you'd need the garlic and balsamic for sure. have fun with that blender! Hahhaha I love that you're putting that stick blender in good use! My friend gave me his a coupla months ago but haven't had the chance to use it yet! Can I just ask, if you're using it straight in the pot, would it touch the base/scratch it? Sorry if this is a dumb question but really curious if I can use it freely or be sure to not touch the base when I use it. Anyway, love the splash of balsamic vinegar in this. Looks lovely! Pure and simple, I love it. A frequent meal in our house is nothing more than cauliflower served in almond sauce. Thank you, love the idea of serving cauliflower with almond sauce - sounds delectable! YAY!!! I just broke my stick blender HAHAHA time to get another one and I love this cauliflower soup and how it's not full of potatoes so it's still light :) WOO HOO! I think one of the best things the blogosphere has given me is a plethora of incredibly delicious ways to use cauliflower. I never used to like it, but I can't think of once in my youth when I had it any way other than raw. 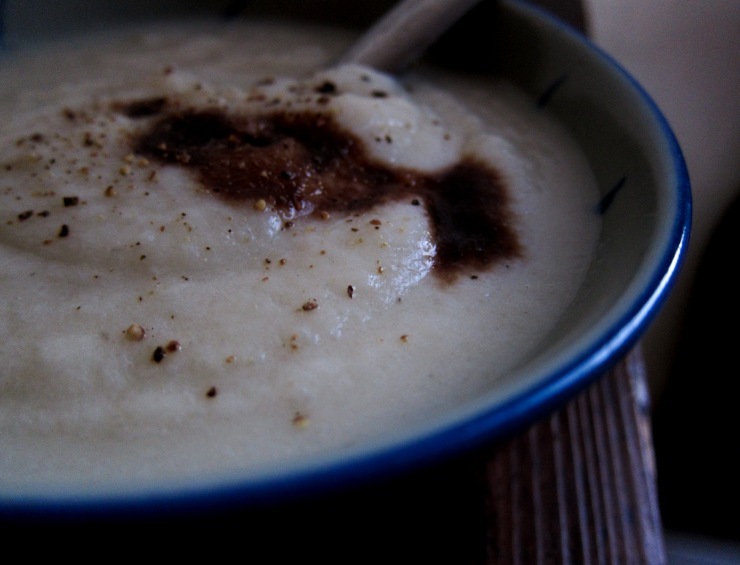 Next time I make cauliflower soup, I will definitely add a little balsamic in - that is fantastic. I love my immersion blender. I'm trying to think of 'extra' ways I use mine... not sure. I guess when I'm making jam, if I want it to be more pureed than chunky, or want it to cook up faster. And applesauce for sure. I've always had cooked cauliflower. It has a tender sweetness to it, very lovely. Oh yes, jam, applesauce! And that brings to mind, various fruit butters, the blender would be awesome for that. I was so excited when I got an immersion blender for Christmas a couple of years ago. It's such a great tool! 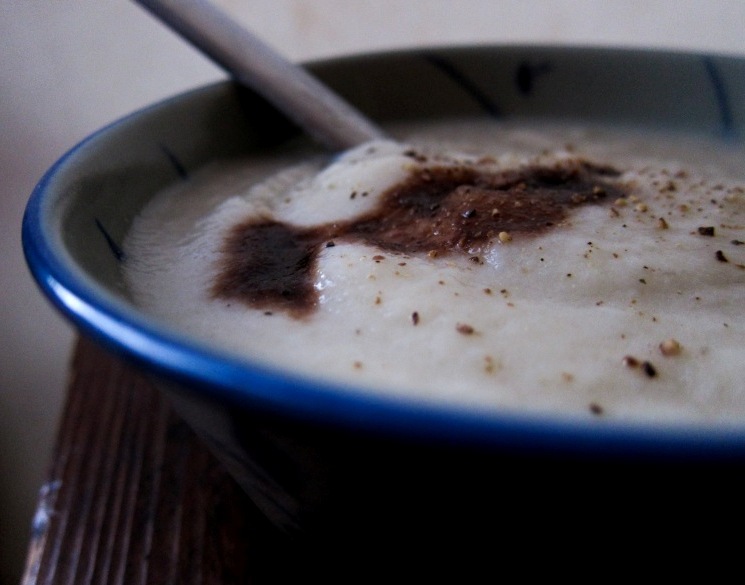 Your cauliflower soup looks yummy (I love cauliflower). Love the splash of balsamic - what a great idea! I've been neglectful in the soup department lately and this simple, flavourful beauty is giving me major inspiration...! Thanks, Julia! I imagine cabbage would be lovely too, it's so sweet when simmered for awhile.